If you are looking for matchplay, you could enter a variety of leagues across the county. For singles and doubles leagues go to www.localtennisleagues.com . For Mens and Ladies Doubles club leagues go to www.cityleag.org.uk . There is also the Jewson and Winter League which is inter-club doubles; Please contact Jane Wasden 01603 702474 for more information. Junior Leagues and competitions will start in April. 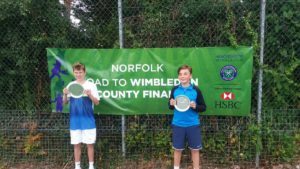 The Road to Wimbledon is an U/14 event for Boys and Girls. All ability levels welcome, with events at schools and clubs before leading onto the national finals at Wimbledon. Go to www.roadtowimbledon.com to find out more. Teams can also enter the Aegon Team Tennis event for ages U/8 upwards. Go to https://www.lta.org.uk/competitions/team-competition/aegon-team-tennis for more information.